Careers in Energy Week is a national event sponsored each year by the Center for Energy Workforce Development to celebrate a critical workforce that provides a vital service to our nation and to raise awareness of the rewarding careers available in the energy industry. From line workers to customer service operators to electrical engineers, these men and women work tirelessly to ensure that businesses and homes across the country always have the energy they need. 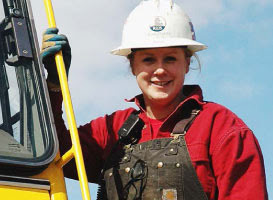 Energy jobs offer promising opportunities to both experienced workers and those just starting their careers. These jobs are active, hands-on, rewarding, and available in every state, in an industry that is stable and growing. Careers in Energy Week 2016, held October 17-21, again brought together events across Washington state sponsored by Avista, Tacoma Power, Washington State Labor Council and the Center of Excellence for Clean Energy. The Center procured the Governor’s Proclamation and Tacoma Power procured the Tacoma Mayor’s Proclamation. New this year to the partnership was the Construction Center of Excellence jointly hosting Construction Career Days with the Washington State Labor Council. These events served a total of 1,735 middle school, high school and community college students, job seekers/job developers, and transitioning veterans. Avista hosted an on-site event on 10/19 for student scholars in the Washington State Opportunity Scholarship STEM program to learn more about the company and the utility industry. Besides an overview of Avista, topics such as in-demand energy careers, career pathways (college and apprenticeship) were discussed. The students were also treated to a Q & A session with a panel of Avista employees representing Engineering, ISIT and Customer Service. They also received a tour of our Electric Shop led by the manager and a Journeyman Meterman. The event was shared on Avista’s social media page and “live tweets” were posted to the WSOS Twitter page. Attached is a group photo from the event and a copy of the group’s Twitter page (contains more group photos and photo of the panel) (4 students). Career Fairs/Events – University of Idaho all majors Career Fair on 10/5, Access Spokane Disability Job Fair (300) on 10/11 (150 job seekers/job developers), Gonzaga University Engineering and Computer Science Career Fair 10/26 (100 students), Eastern Washington University Engineering and Computer Science Career Fair on 10/27, and Colville Rotary Career Fair 10/27. Construction Career Days is an industry sponsored event for high school students to introduce them to the various career opportunities available in the construction industry. Students were provided the opportunity to try hands-on projects and operate heavy equipment and machinery, as well as meet with industry representatives from the trades and higher education, October 12/13. U.S. Senator Maria Cantwell (D-Wash.) and Department of Energy (DOE) Secretary Ernest Moniz convened a roundtable discussion at the Pacific Northwest National Laboratory on Aug. 16 to focus on new approaches and opportunities for training Washingtonians for the high-paying jobs that will close the growing skills gap in the energy industry. The roundtable brought together representatives from the laboratory, higher education, organized labor, regional economic development, as well as students and local elected officials. The discussion centered on how governments, businesses, education and training organizations can work together to provide the job skills that energy companies will increasingly require in the coming decades. The DOE’s Quadrennial Energy Review found that the energy sector will need to fill 1.5 million new jobs over the next 15 years. A new report from Sen. Cantwell’s staff estimated that 234,000 of those jobs will be on to the West Coast. Senator Cantwell’s staff also unveiled a report documenting the challenges Washington state faces in preparing its workforce for tomorrow’s energy industry. The report highlights the need for increased public and private investment in workforce training and apprenticeship programs. Coordinating resources towards energy job training will not only provide an economic boost to Washington state, but also keep American workers competitive on the global stage. Washington’s Centers of Excellence for Marine Manufacturing and Clean Energy recently commissioned Alan Hardcastle, PhD, Washington State University Social and Economic Sciences Research Center to research mechatronics current concepts and practices in the marine and energy industries. The report entitled Mechatronics in Washington State: Manufacturing, Energy and Martine Sectors identified a growing number of national and state-level education-industry partnerships that are working to design education and training programs, degrees and certifications that are better attuned to the changing needs of employers for technical employees in modern industrial settings. Mechatronics is a multidisciplinary field of engineering with roots in the manufacturing industry that combines mechanical, electronic, computer, software, control and systems design engineering in order to design and manufacture useful products. Factory automation equipment and Industrial robots are typical examples of products that integrate mechanical, electronic and software systems. The infusion of mechatronics principles and practices in the workplace also has implications for the knowledge, skills and abilities required of employees in most modern industrial settings. The design, installation, maintenance and repair of new, integrated high-tech systems places greater emphasis than in the past on interdisciplinary knowledge and multi-skilling that also cuts across many occupational areas. These transferrable skills are increasingly in demand by employers across many different industry sectors, including energy, marine technology, construction and food processing. Recently a panel of industry leaders gave insider tips on hiring for jobs in the energy and engineering fields as part of the Center’s Energy Job Seeker Workshop. 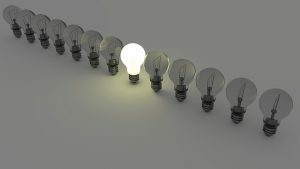 They shared examples based on their own experiences navigating the hiring process as well as serving as hiring managers and watching people either succeed or spoil their own chances at a dream job. Here’s a list of advice taken from the session. Students who will be entering grades 9 through 12 are invited to register for a week of fun and learning June 20 to 24 at the FWEE Hydropower and STEM Career Academy at Rocky Reach Dam. The Center’s Energy Education Resource Guide is now available! Here you’ll find a list of community and technology colleges under the energy and pre-engineering umbrella–from Bates to Yakima. You’ll also get details on the specific programs offered by each, from Electrical Construction to Plant Operations to Wind Technology. The guide features a story that generated a lot of buzz when we posted it to our Facebook page. “From Shipyard to Heat Pumps” is a real-life ‘Rosie the Riveter’ tale about a single mother who, after being laid off from her beloved shipyard job, successfully transitioned into a career in the energy field. 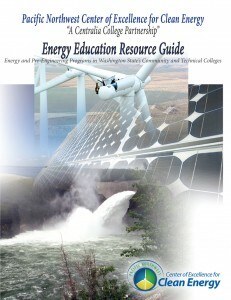 Also included in the guide is a list of clean energy employers in Washington state and a handy map of the colleges with energy and pre-engineering programs. Get the guide as a PDF at this link. In Matt Morrison’s eyes, the Pacific Northwest isn’t like Vegas; what happens here shouldn’t stay here, at least in terms of clean energy. He believes the way we solve the energy problem in the Northwest could serve as a powerful model not just for the U.S. and Canada, but for the rest of the world. As executive director of the Pacific NorthWest Economic Region (PNWER), he sees great potential in the future of clean energy, with the Northwest well-poised to lead the way in the areas of hydroelectric power and wind generation in particular. The Pacific Northwest Center of Excellence for Clean Energy (PNCECE) is hosting a Job Seekers Workshop for Energy Technology, Electronics, Robotics, and Automation Students and Graduates featuring an interview panel of local utilities representatives. Register at the link below by April 1 to attend the April 7-8 Job Seekers Workshop. NOTE: You must also submit a resume by April 1 to cindyretcs [at] gmail [dot] com. The two-day workshop takes place at Centralia College’s Kemp Hall. 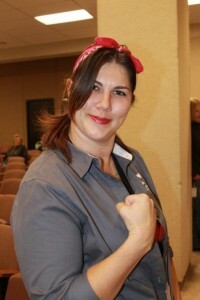 Bowles as “Rosie the Riveter,” an icon for many women in the trades. Rosie the Riveter was popularized during WWII when women filled trade roles left by men called to the front lines. It was 2007, and Sara Bowles found herself out of a job. She’d survived the first round of layoffs at Westport Shipyard in Hoquiam, but the second one swiped a position as metal polisher right out from under her. The problem was, the maritime pleasure craft industry wasn’t exactly recession proof. She did finish work on metal handrails and other parts that went into multimillion dollar yachts, and when the economy tanked, there wasn’t as much call for those.